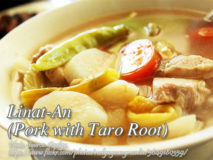 Nilagang manok or boiled chicken soup is one of the simplest Filipino recipes by just boiling the chicken and putting all the vegetables and spices in.. 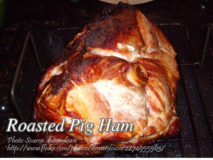 This recipe can be used also if you are roasting a whole pig or pig’s head. Since not everyone will be roasting a whole pig,.. 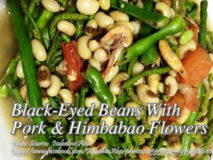 This recipe is from Cagayan Region 2. For those not very familiar with Himbabao or alucon (a tagalog version), it is a caterpillar shaped flowers.. 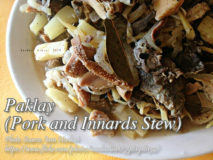 This pork meat and innards stew recipe is from Southern Mindanao Region 11 (Davao). Known as paklay, it is composed of pork meat, usually the pork..
Pork chops are not for frying only, you can make an exotic dish like this one from Northen Mindanao region 10. It is somewhat similar..